The gender punishment gap is important. Although much of the existing research on gender discrimination has focused on wages and hiring decisions, 60% of discriminatory lawsuits involve discriminatory firings. Our findings have the potential to speak to these patterns. Moreover, the punishment gap persists throughout one’s career. This feature makes it costly for women and provides insight into what might drive the disparities between men and women in the workplace. Thus, unlike initial hiring and wage decisions, the punishment gap occurs after the firm has already formed a longstanding relationship with the employee. More broadly, if women are held to a different standard than men, like we establish, it could limit the career progression of women in a well-paying human-capital-intensive industry. Our analysis covers the universe of financial advisers registered in the U.S. over the period 2005 to 2015. Currently there are 650,000 registered financial advisers in the United States. The Financial Industry Regulatory Authority (FINRA) requires that financial advisers formally disclose all customer disputes, disciplinary events, and financial matters, and FINRA makes these records publicly available on its website. Using these regulatory records, we can identify when advisors engage in misconduct. Our previous study shows that misconduct is relatively common in this industry, with roughly one in thirteen advisers having a past record of misconduct. Misconduct offenses include customer disputes resulting in a settlement/award, internal firm discipline, and regulatory and criminal offenses. For example, an adviser could be flagged for misconduct if he/she executed trades in a client account without the client’s consent. Roughly 20% of misconduct events involve unauthorised trading. We measure the punishment gap as the difference in labour market outcomes between male and female advisers following misconduct. The figure below displays the turnover in the financial advisory industry. 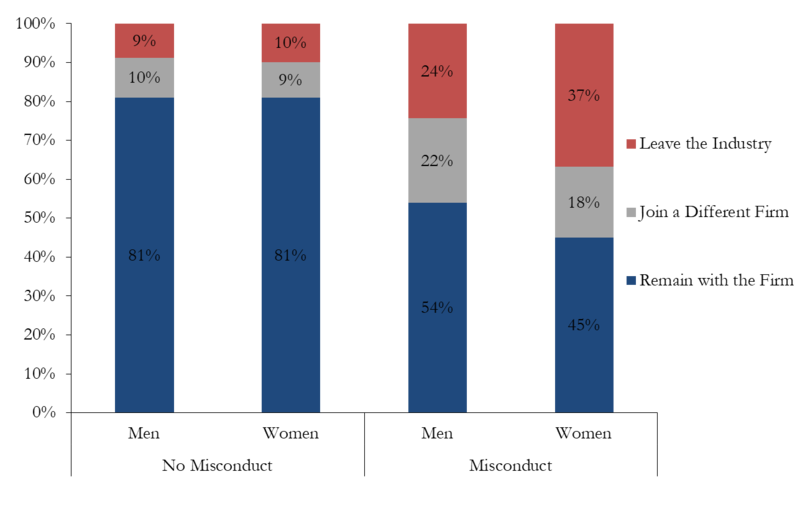 Columns (1) and (2) of figure show that in a typical year 19% of male and female advisers leave their firm. After being reprimanded for misconduct, 46% of male advisers experience an employment separation (column 3). Conversely, 55% of female advisers experience an employment separation following misconduct (column 4). The results suggest that women are 20% more likely to lose their job following misconduct. The punishment gap extends beyond the firm to the industry level as well. After losing their job following misconduct, 47% of male advisers find new employment in the industry. In contrast, only 33% of female advisers find new employment in the industry after losing their job following misconduct. Overall, the results suggest that while 76% of male advisers maintain employment in the industry following misconduct, only 63% of female advisers maintain employment in the industry following misconduct. What seems to be driving the gender punishment gap? One potential explanation is that women engage in different types of misconduct. For example, if women engage in more costly offenses or are more likely to be repeat offenders, this could explain why women face more severe punishment. However, the data suggests the exact opposite. Men are twice as likely to be repeat offenders and engage in misconduct that is 20% more costly. An alternative explanation is that the gender punishment gap is driven by differences in productivity. A firm may be less tolerant of misconduct by a financial adviser who brings in less money for the firm – and perhaps there are gender differences in how much money they bring to the firm. An advantage of studying the financial advisory industry is that we can measure adviser productivity. We find that the gender punishment gap persists even when we control for the amount of money an adviser manages and compare male and female advisers working in the same firm, in the same branch, and at the same time. Instead of these differences being driven by the alternatives above, we find evidence suggesting that the punishment gap is driven in part by the composition of firm management and executives. The gender punishment gap varies drastically across firms and is mitigated by the gender composition of management. At firms with no female representation at the executive/ownership level, female advisers are 42% more likely to experience a job separation following misconduct than their male colleagues. On the other hand, firms with equal representation of male and female executives/owners discipline male and female advisers at similar rates. Interestingly, we document a similar punishment gap for ethnic minority male advisers. African and Hispanic advisers are more likely to experience an employment separation and face worse reemployment prospects following misconduct relative to their non-minority colleagues. We again find that the punishment gap is smaller at firms with more minorities in management and executive positions. Collectively, our results suggest that gender and minority punishment gaps are driven by “in-group” favouritism. Our findings provide new evidence of a potentially less-salient and costly gender difference in the workplace, the gender punishment gap. The financial advisory industry is willing to give male advisers a second chance, while female advisers are cast from the industry for similar or less severe missteps. 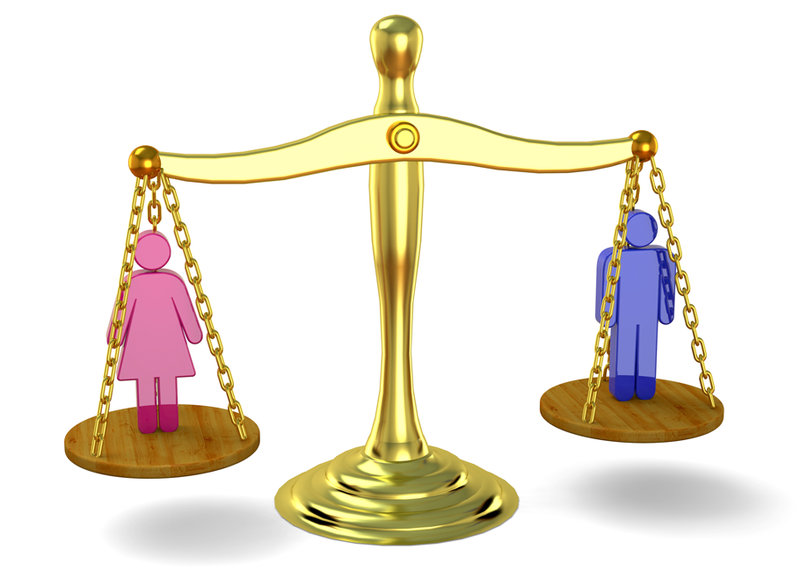 We find evidence that the gender punishment gap is driven by in-group favouritism. The effects of the gender punishment gap are costly, long-lasting, and may ultimately contribute to the glass ceiling faced by women in finance. Mark Egan is an assistant professor at Harvard Business School, Gregor Matvos is Professor of Finance at the University of Texas at Austin, Amit Seru is Professor of Finance at Stanford Business School.